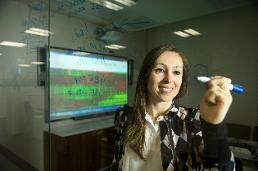 Heloisa's doctoral research is in the area of Breast Cancer, specifically Bioinformatics. Her PhD is titled "An Investigation on the Consensus Between Different Genomic and Transcriptomic Results in Breast Cancer". (3) to undertake a short-term research period with A/Prof David J. Wild at the Indiana University, in Bloomington IN, USA. The main objective of my research is to improve the understanding of breast cancer molecular architecture by applying bioinformatics approach to develop new strategies for the clinical setting. In line with my research, the IMPAKT 2015 Breast Cancer Conference brought together a community of experts (about 525 at the event) to enhance the translation of fundamental research, with new discoveries put in the context of the medical practice. During the conference, I had the opportunity to meet and interact with renowned people from all over the world. It was an open ground to seed future collaborations, exchange opinions, and build solid connections with breast cancer researchers, scientists and clinicians. Of among 100 abstracts selected for this conference, only 10 were listed for the “poster walk”. 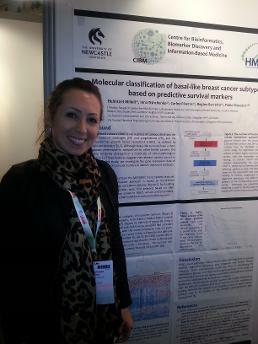 The work I submitted – “Molecular classification of basal-like breast cancer subtypes based on predictive survival markers” – was one of them. In this occasion, I had the opportunity to discuss my achievements with experts in the field, including Dr W. Fraser Symmans, the Director of Research Operations University of Texas MD Anderson Cancer Center, in Houston TX, USA. I certainly gained some new and useful insights for my research from these discussions; insights that were applied to a paper recently submitted for publication. In my visit to Breast Cancer Translational Research Laboratory J.C. Heuson, directed by Christos Sotiriou MD PhD, Institut Jules Bordet, Brussels, BE, I interacted with Françoise Rothé, the lab manager. She showed me the institute (part of it) and described the research and experiments that they have been doing in the laboratory. I was introduced to other PhD students, post-doctorates and researchers, including Christine Desmedt, a member of the scientific committee of the IMPAK 2015 Breast Cancer Conference. It was a great experience to meet with such a wide variety of professionals. On the same trip, I organized meetings with collaborators in London, UK. There, I visited Wendy Alderton, Julie Barnes and Sophia Apostolidou at the University College London, Cristina Legido-Quigley from King's College London, and Francesca Lake the managing editor of Future Science Open Access. These meetings helped to consolidate international collaborations between The University of Newcastle (UoN), Hunter Medical Research Institute (HMRI) and other institutions, on breast cancer and Alzheimer’s disease (initially). A month after the meeting with Francesca Lake, I had the pleasure to receive an invitation to be part of the Young Ambassador panel to support the Future Science Group and the Future Science Open Access. Additionally, the short-term exchange program, coordinated by A/Prof. David Wild, has been crucial in the next step of my research with the application of algorithms and tools for large scale integrative data mining of drug discovery. We used bioinformatics, cheminformatics, and toxogenomics to investigate compounds that target the breast cancer markers defined for each intrinsic subtype. In particular, we have delineated drugs to target basal-like breast tumours, one of the most aggressive types with limited drug response. Based on the literature the drugs are promising for other tumours and have not been tested for breast cancer. Further research, however, is required to design in vitro tests. While in Bloomington IN, USA, A/Prof David Wild organized meetings with PhD students and academic members at Indiana University, as well as a day trip to visit the pharmaceutical company Lilly where I met other researchers and collaborators. I have no doubts that these experiences have broadened my horizons and opened doors for future collaborations. 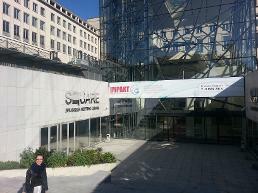 The IMPAKT 2015 Breast Cancer Conference is an international meeting that brings together a community of scientists and clinicians to deal with the challenges of improving patient care. It is an open ground to seed future collaborations, exchange opinions, and build solid connections with other students and professionals. Visiting laboratories and universities worldwide is important to enrich the learning experience and to facilitate collaboration among international institutions, the University of Newcastle (UoN) and the Hunter Medical Research Institute (HMRI). As a PhD student and an early career researcher, I understand this scholarship is a unique opportunity for both personal and professional growth. It is also inspiring to young scientists who want to make a difference in the future of research. ­­­­­­­­­­­­­­­­­­­­­­­­­­­­­­­­­­­­­­­­I express my warm thanks to Jennie Thomas for her enthusiastic support of students and researchers through a number of grants and scholarships. Being part of Jennie’s family is a great honour and an enormous pleasure. Thank you, Jennie, for believing in my research, for supporting my career and for funding my dreams!